A fixture on the early season of the IZOD INDYCAR Series since 2005, the 2012 edition of the St Petersburg street race had never received so much dedicated focus as it has when the brand new Dallara DW12 vehicles hit the 14-turn, 1.8-mile circuit. The first race for what will be the new look of the IZOD INDYCAR Series, the racing tour left 2011 mourning the loss of a two-time champion Indianapolis 500 winner Dan Wheldon. With many memorials setup around the temporary street course (including the naming of one stretch of street as 'Dan Wheldon Way'), the Honda Grand Prix of St Petersburg would be initiated by a green flag from Dan Wheldon's sister Holly. Demonstrating true dominance early in the weekend, Chevrolet powerplants began to show some serious muscle early into the IZOD INDYCAR Series' first "Engine war" since 2005. Chevy-powered Team Penske #12 car of Will Power took pole while teammate Ryan Briscoe's #2 machine joined him on this monumental front row. As the top-5 in Saturday's qualifying were all Chevrolet powered Dallaras, the powerplants from Honda and Lotus would use 100 laps in Sunday's Honda Grand Prix of St Petersburg as a chance to mount an offensive on the "Bowtie Brigade". The first caution of the 2012 IZOD INDYCAR Series season was entered on lap 13 of the Honda Grand Prix of St Petersburg when the #6 Lotus-powered machine of Katherine Legge lost power on the frontstretch. Part of the Lotus-Dragon Racing team, Legge would return to the race competition only to later fall victim to her vehicle shutting down. Katherine Legge's #6 car ended parked near the exit of pit road but out of harm's way. A two-car team the second Dallara DW12 vehicle of Sebastien Bourdais would also encounter misfortune in his first event back to full-time competition in United States open wheel racing for 2012. With Will Power handed early advantage at the 2012 Honda Grand Prix of St Petersburg by virtue of his pole win, the event was seemingly the Australian's race to lose. After leading the first 11 laps of the race, the #12 Team Penske car pitted early and lost touch with the front of the field. Initially surrendering the lead to teammate Ryan Briscoe, Will Power would be unable to contend with the front pack at any other point in the IZOD INDYCAR opener. "We just got shuffled back a bit there after the first pit stop and we just couldn't make up the ground we needed. It was very tough to pass." 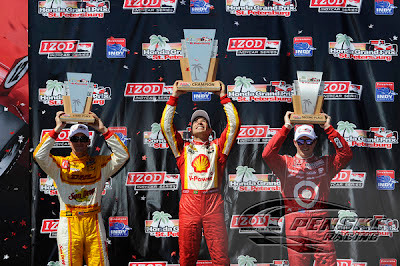 said Power who settled with a 7th place finish in the first IZOD INDYCAR Series event for 2012. Four laps following the completion of the Hond Grand Prix of St Petersburg's first caution period, the yellow flag was displayed once again when James Jakes nosed the #19 car into the turn 10 tire barrier. Also during the second caution, Tony Kanaan slowed to a stop in his #11 Chevrolet-engined car for KV Racing Technology. An electrical voltage drop was recorded by the Brazilian driver commenting in post-race, "From Lap 1 I started to get the low voltage alarm. I don't know if, I think it was the alternator. I could tell it was the battery because my dash went blank, and with the electronic nowadays you cannot pull out of gear, if the dash is not working." Finishing so strong at the 2011 race as a first time outing for KV Racing Technology, Kanaan's 2012 St Petersburg race ended after just 21 laps. New car gremlins seemingly bit the KV Racing Tachnology car of former Formula 1 star Rubens Barrichello. While Barrichello completed all but two laps, the Brazilian's #8 car fuel meter issue contributed to the car running out of fuel. When the 2012 Honda Grand Prix of St Petersburg concluded, there was seven recorded mechanical problems in the final result. It appeared that new car blues had plagued the wide range of teams and even cars using all three engine companies. In the early stage of second caution, the lead changed once again when Briscoe pitted. The #9 Target/Chip Ganassi Racing of Scott Dixon took over the race. After starting the race in 6th place, Scott Dixon (the highest-positioned Honda at the beginning of this event) would lead 37 laps on the day. Dixon's performance at the front was a major difference from the effectiveness of teammate and reigning IZOD INDYCAR champ Dario Franchitti. Stationed in the middle of the field for much of the Honda Grand Prix of St Petersburg, Franchitti fell to 13th place after running out of fuel on the last corner in the final lap. After a segment where the St Petersburg race was led by Rahal Letterman Lanigan Racing's #15 car piloted by Takuma Sato, a crucial pass by the #3 car of Helio Castroneves on Scott Dixon set the Brazilian onto the course for his first win since 2010. Leading for 28 laps including the final 25, Castroneves' Team Penske car survived contact with the #20 car of Ed Carpenter to pull out a 5.5-second interval on Dixon to go on to victory at the Honda Grand Prix of St Petersburg. 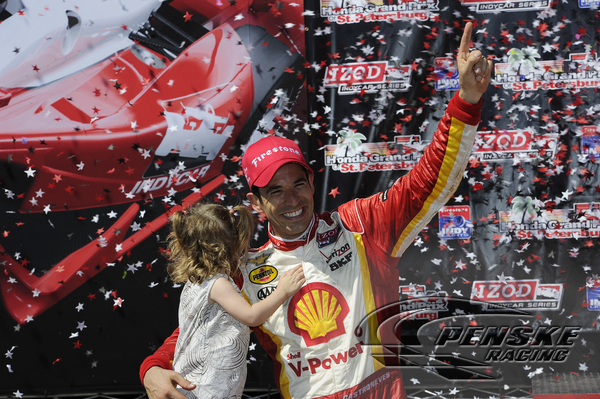 By winning, Helio Castroneves gives a Chevrolet engine it's first victory lane appearance sine Nashville of 2005. In post-race, Castroneves commented on his race saying "No question, these guys are awesome, Ryan (Briscoe) and Will (power), and for me it's a great Chevy-power group, it's been always consistent. It might not be the quickest, but I did say out loud, 'If I start in the top six, I'll win this race.' And we did it, we are here in Victory Circle." Shortly after taking the checkered flag, Helio Castroneves made a personal gesture to a fallen competitor when he brought his #3 Shell/Pennzoil-sponsored Team Penske car to a stop along turn 10. Climbing out of his race vehicle shortly after his IZOD INDYCAR race win, Castroneves leaped the fence along Dan Wheldon Way. Giving his former competitor a thoughtful salute, the emotional Brazilian driver talked about his impromptu tribute. "You can never question God's mysteries, and today for me, I ended up stopping [my car] on Turn 10, and honestly I did not plan it, it was just the way it happened, and there was the sign Dan Wheldon Way. So for me, and for all of us, the drivers and the fans, not having him here certainly we'll miss. But we've got to remember him as he lived, the way he lived, and continue to pray for his family." said Helio Castroneves. With Helio Castroneves and Scott Dixon finishing in the top-two spots in the debut event for the 2012 IZOD INDYCAR Series, the next two positions were dominated by Andretti Autosport cars using Chevy power. 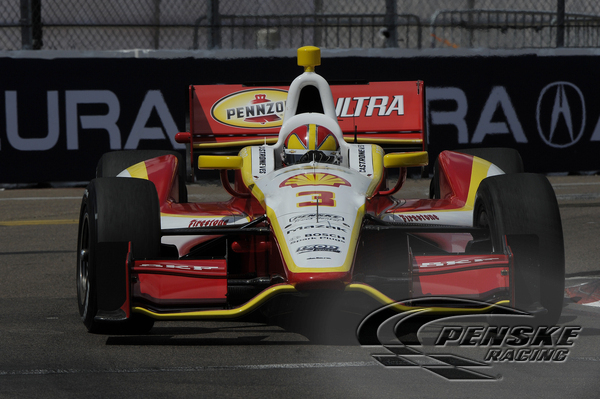 Ryan Hunter-Reay finished 3rd while James Hinchcliffe equalled his best ever series result with a 4th place run. 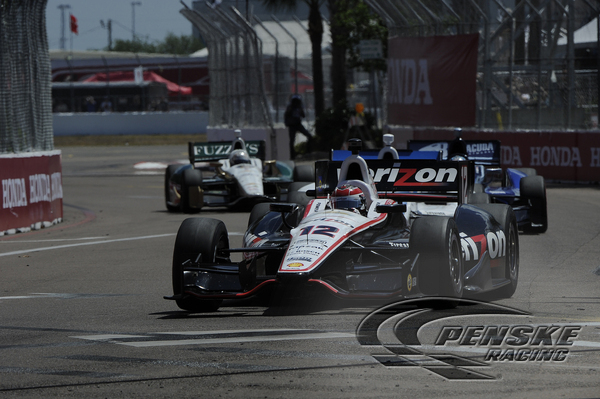 Rounding out the top-five was the Penske entry driven by Ryan Briscoe. Other honourable mentions in the results of the 2012 Honda Grand Prix of St Petersburg reveals Simon Pagenaud as the highest finishing rookie contender with a fine 6th place with the #77 Schmidt-Hamilton Motorsports car. Moving up 13 positions during the course of the 100-lap event to finish 9th, sophomore driver Charlie Kimball took part in a strong opening race with his Chip Ganassi Racing team. In 15th place, Canada's Alex Tagliani scored the highest final result for a Lotus-engined Dallara. With Helio Castroneves putting a cherry on top of the sundae for Team Penske's delightful 2012 IZOD INDYCAR start, the series leaves St Petersburg ready to take on Barber Motorsports Park.